The design of some houses, consisting of many unsightly columns and corners, could be an eyesore and a headache to the owner. Instead of plastering the columns over with wallpaper, the Wrap-Around-the-Corner photo frame could be a better option. It not only maximizes space usage effectively, it can turn hideous columns into beautiful corners for guests to admire. 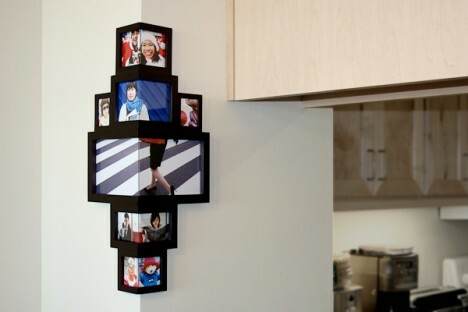 The creatively designed wrap-around-the-corner photo frame from Photojojo can be comfortably fixed at any corner. It consists of 12 frame slots which can hold up to 12 photographs of various shapes and sizes: four 2.5″ x 3″ frame slots, four 3″ x 3.5″ frame slots, two 3.5″ x 4″ frame slots and two 5.5″ x 7″frame slots. To insert a photo and create the wrapping effect, users just need to splice the photo into half and fit it into the adjacent slots. The Wrap-Around-the-Corner photo frame is made of Espresso stained and lacquered hardwood and priced at $99. It might sound a bit costly but the elegant and state-of-the-art effect on a house is mesmerizing. If this product can be digitalized, it would definitely be a much sought-after furniture or house display.